Sebarenzi grew up in Rwanda, and as a child saw glimpses of the tribal violence which years later would engulf his country. In 1994, when Hutu extremists slaughtered more than 800,000 Tutsis, Sebarenzi and his immediate family were safely out of the country, but many of Sebarenzi’s extended family were not so lucky. Returning to Rwanda, Sebarenzi rose through the ranks of Parliament, eventually becoming Speaker, third in power only to the country’s president. As the leader of parliament, Sebarenzi worked to improve good governance, speaking out for the independence of the legislature and against corruption in the government. Forced to resign, and Informed of a plot to assassinate him, he fled Rwanda and found exile in the United States. He still champions a broad process of restorative justice in Rwanda as the country struggles with the ongoing effects of mass genocide and retaliatory killing among its Hutu and Tutsi people. 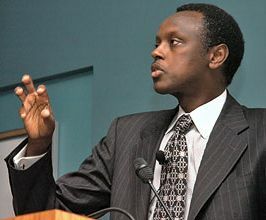 Sebarenzi teaches conflict resolution at the School for International Training, lectures on his experiences, consults, and works toward his PhD. Sebarenzi has also been an executive for national and international nonprofit organizations and a regular speaker on BBC and Voice of America. He plans to return to Rwanda eventually, and hopes his home country will soon be a safe place for people of all races, creeds and heritages. For his college lectures, Sebarenzi tells his dramatic and historic story, and imparts a message of peace and forgiveness. This unforgettable and emotional program is perfect for International Studies departments, Genocide Programs, African Studies, Multi-Cultural Programs, Peace Groups, Progressive Groups, Christian organizations and keynote lectures. Whatever your group, Dr. Joseph Sebarenzi is a man of peace and grace whose message will not soon be forgotten. “God Sleeps in Rwanda: A Journey of Transformation” – by Dr. Josephen Sebarenzi. This memoir tells the story of Dr. Joseph Sebarenzi, whose parents, seven siblings, and countless other family members were among 800,000 Tutsi brutally murdered over the course of ninety days in 1994 by extremist Rwandan Hutu — an efficiency that exceeded even that of the Nazi Holocaust. All American Speakers is a speakers bureau and booking agency providing information on booking Joseph Sebarenzi for speaking engagements, personal appearances and corporate events. Contact an All American Speakers Bureau booking agent for more information on Joseph Sebarenzi speaking fees, availability, speech topics and cost to hire for your next event. Please Note: All American Speakers Bureau acts only as an entertainment broker/producer for corporate functions, private engagements and special events. All American Speakers Bureau does not claim or represent itself as the exclusive agent or management of Joseph Sebarenzi or any artist on this website. Speaker fees are determined based on a number of factors and may change without notice. Fees often vary based on a number of factors including: speakers schedule, supply and demand, length of presentation, location of event and other factors. Fee Ranges listed on this website are intended to serve only as a guideline. In some cases, the actual price quote may be above or below the stated range.